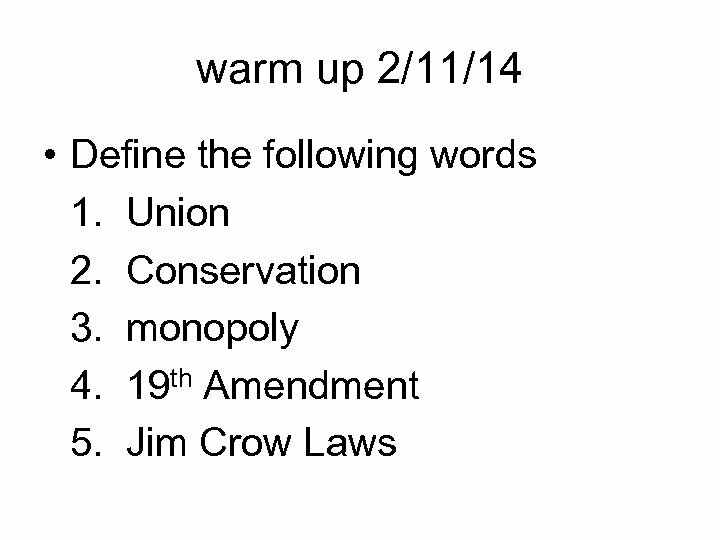 warm up 2/3/14 • Why is it important to have national parks, monuments and forests? 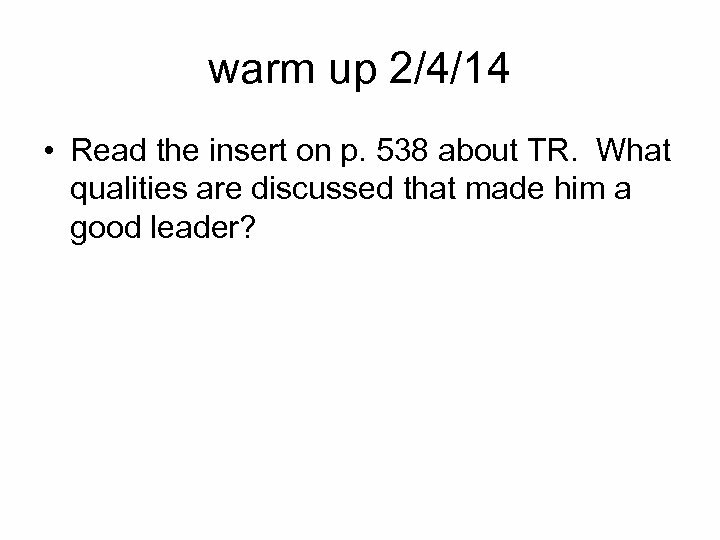 warm up 2/4/14 • Read the insert on p. 538 about TR. What qualities are discussed that made him a good leader? 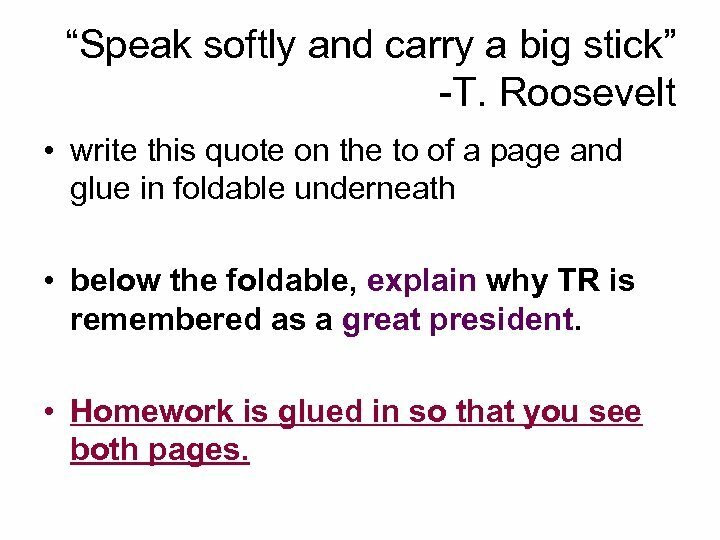 “Speak softly and carry a big stick” -T. Roosevelt • write this quote on the to of a page and glue in foldable underneath • below the foldable, explain why TR is remembered as a great president. 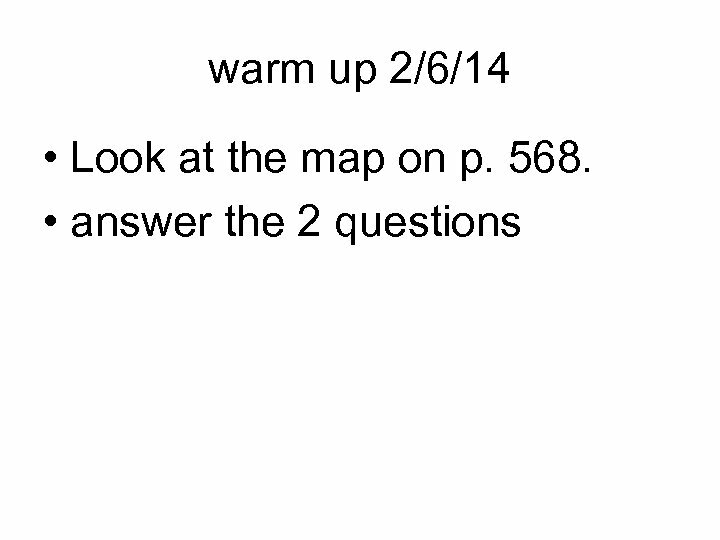 • Homework is glued in so that you see both pages. 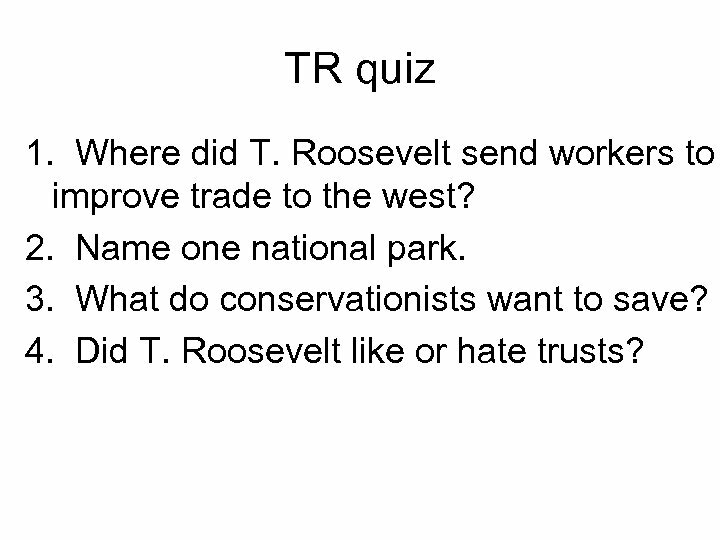 TR quiz 1. 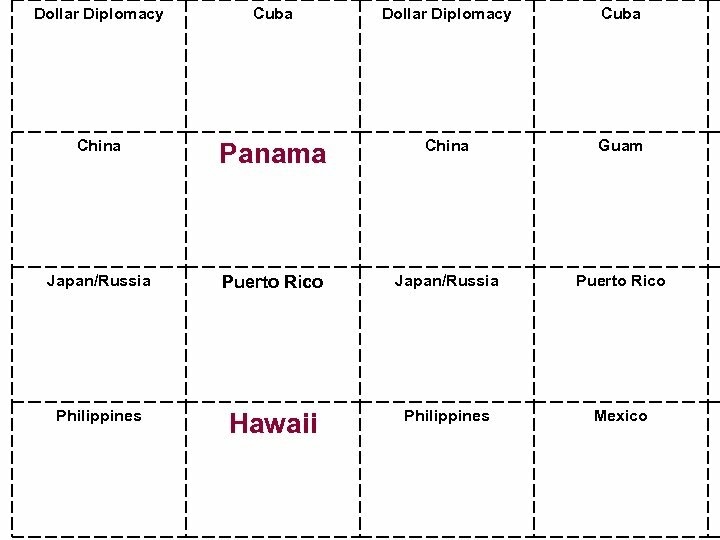 Where did T. Roosevelt send workers to improve trade to the west? 2. 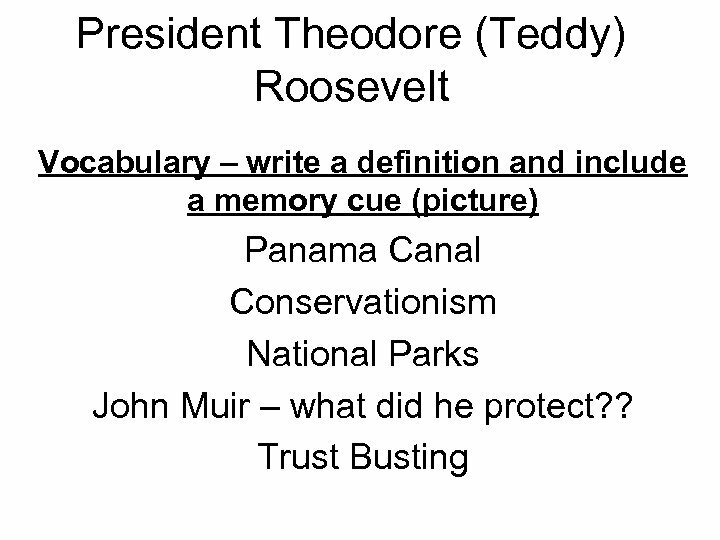 Name one national park. 3. What do conservationists want to save? 4. 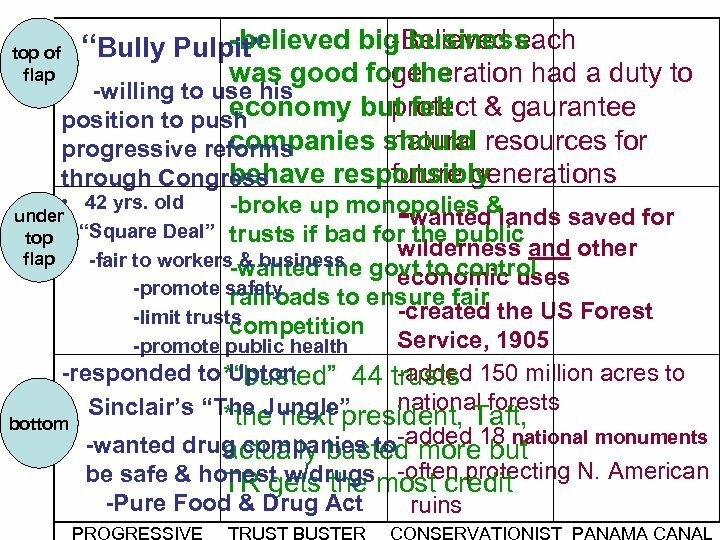 Did T. Roosevelt like or hate trusts? 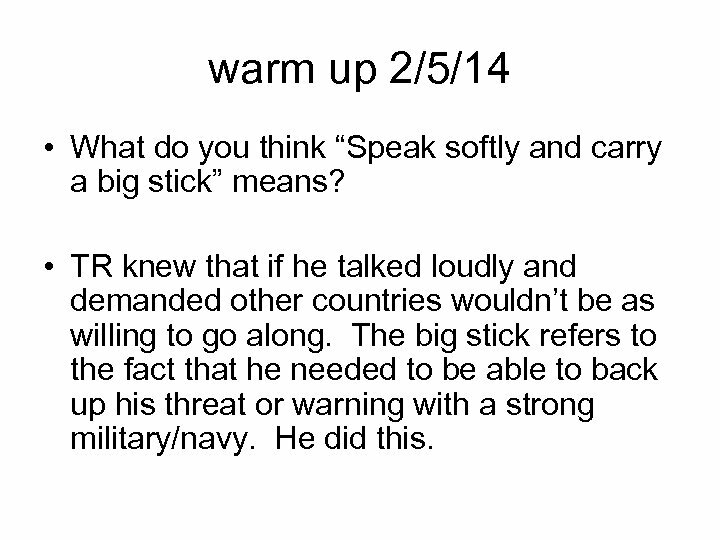 warm up 2/5/14 • What do you think “Speak softly and carry a big stick” means? • TR knew that if he talked loudly and demanded other countries wouldn’t be as willing to go along. The big stick refers to the fact that he needed to be able to back up his threat or warning with a strong military/navy. He did this. 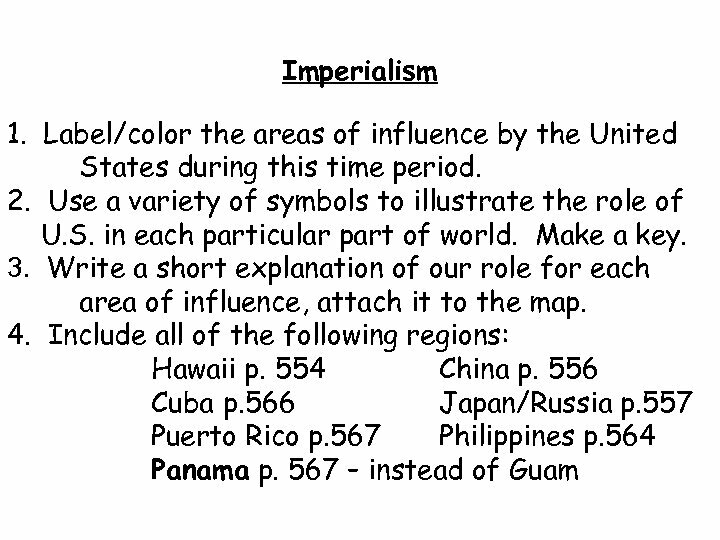 read p. 552 – 553 about imperialism, write a definition on your note sheet by the word “imperialism” • with the person next to you, make a list of the benefits of imperialism and write them in the space on your note sheet next to P-A War. • Read p. 559 -560 & 562 about the Spanish. 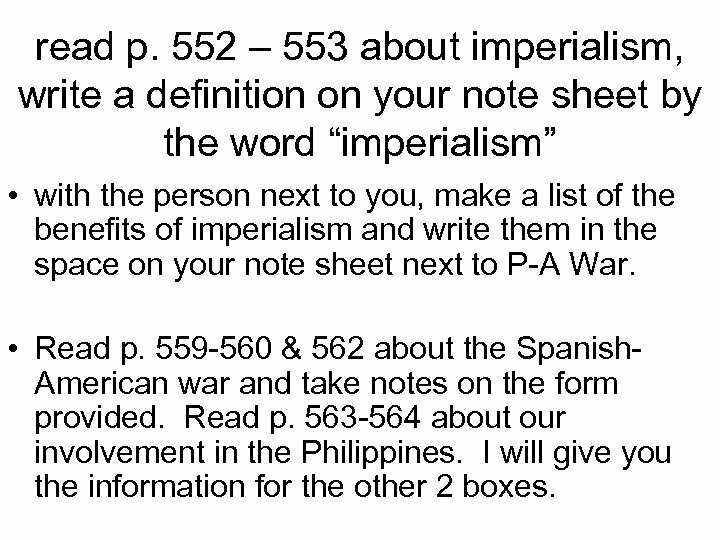 American war and take notes on the form provided. Read p. 563 -564 about our involvement in the Philippines. 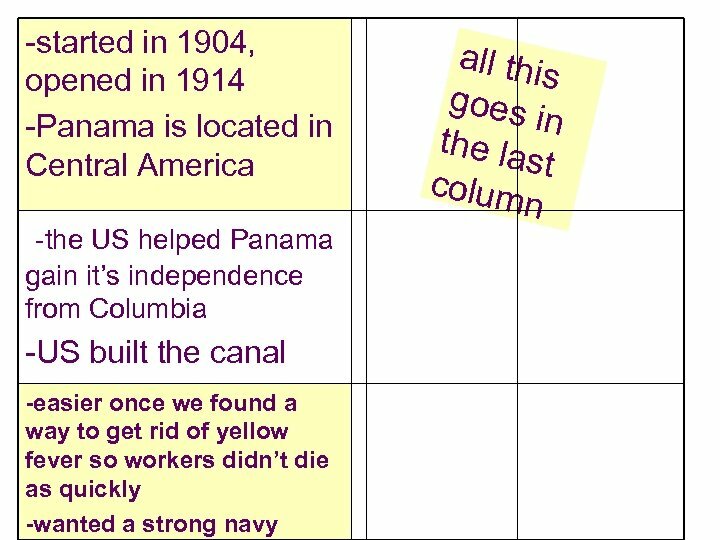 I will give you the information for the other 2 boxes. 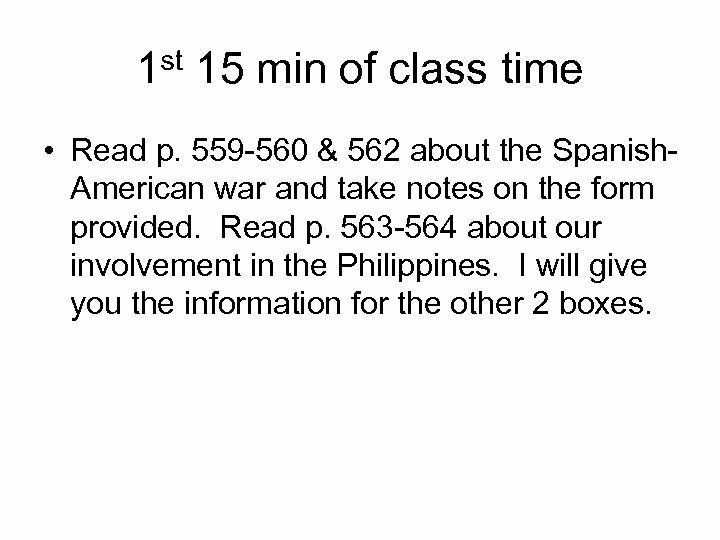 1 st 15 min of class time • Read p. 559 -560 & 562 about the Spanish. 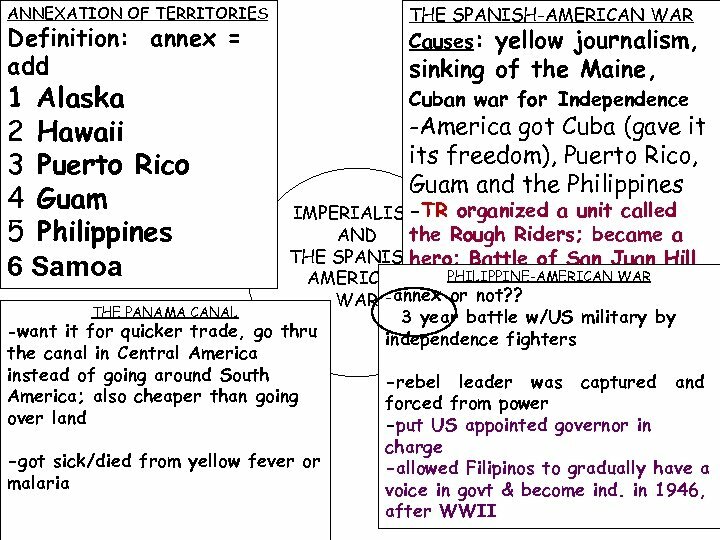 American war and take notes on the form provided. Read p. 563 -564 about our involvement in the Philippines. I will give you the information for the other 2 boxes. 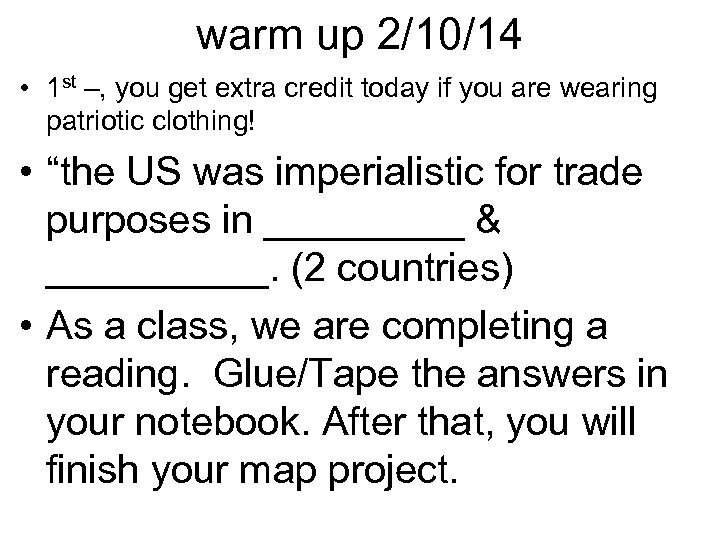 warm up 2/10/14 • 1 st –, you get extra credit today if you are wearing patriotic clothing! 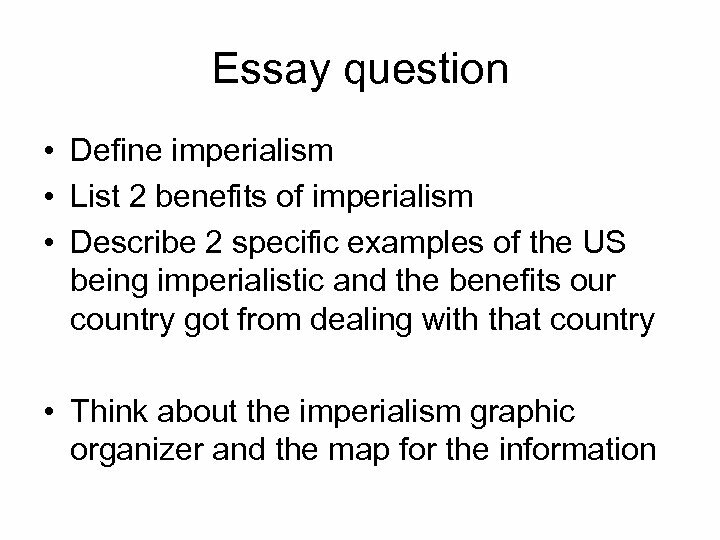 • “the US was imperialistic for trade purposes in _____ & _____. 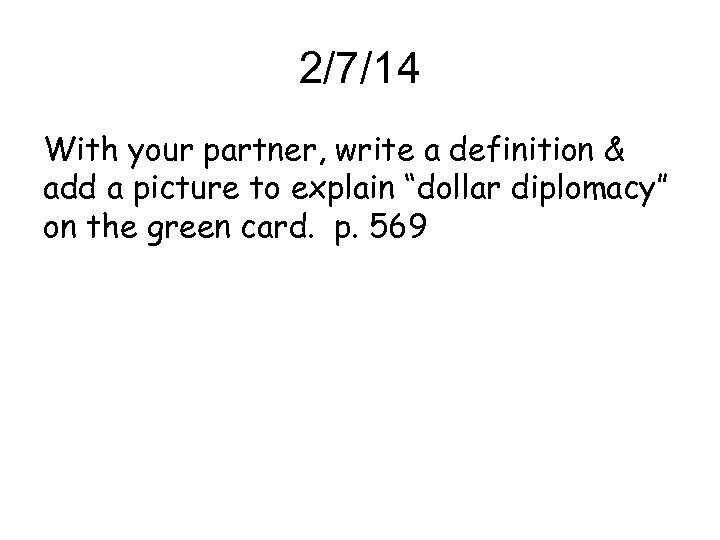 (2 countries) • As a class, we are completing a reading. 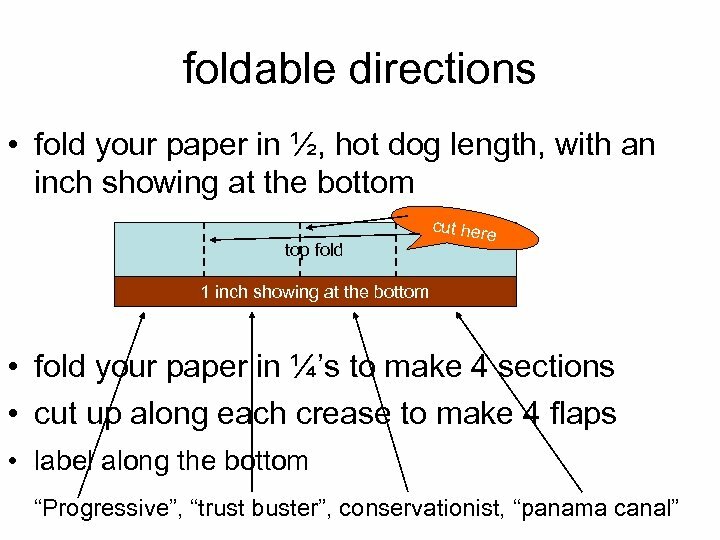 Glue/Tape the answers in your notebook. 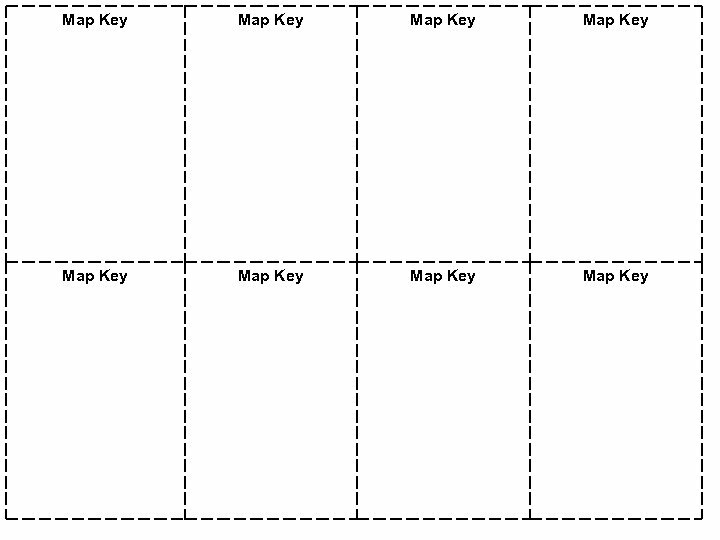 After that, you will finish your map project. 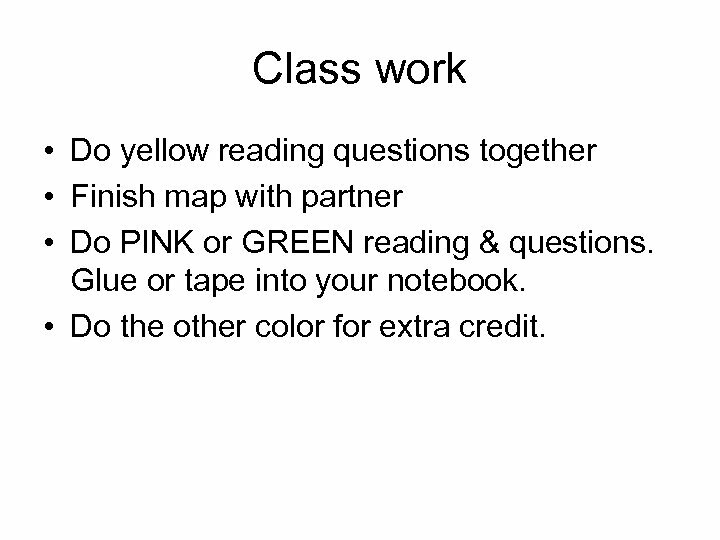 Class work • Do yellow reading questions together • Finish map with partner • Do PINK or GREEN reading & questions. 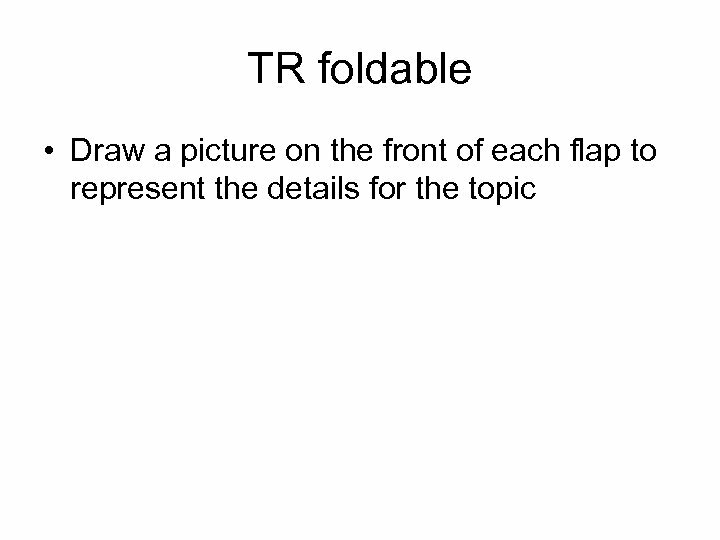 Glue or tape into your notebook. 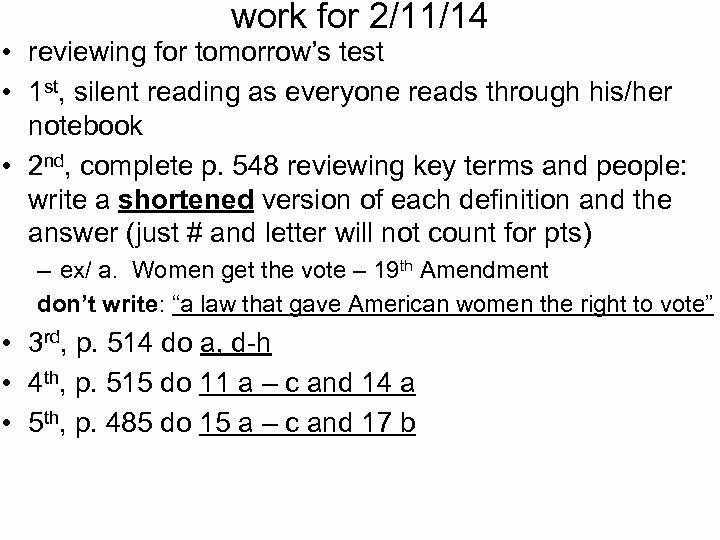 • Do the other color for extra credit. 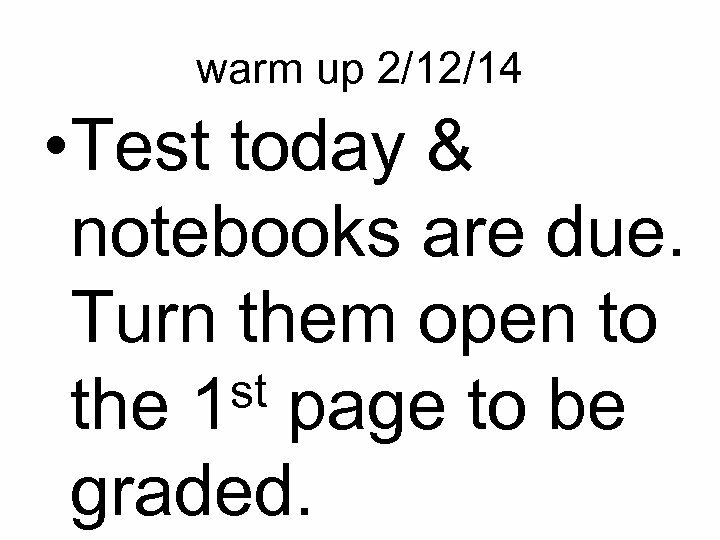 warm up 2/12/14 • Test today & notebooks are due. Turn them open to st page to be the 1 graded.